The worst part is that Bibi is making a joke out of it … instead of putting forth a program, his game is to attack the opposition … Sound familiar? 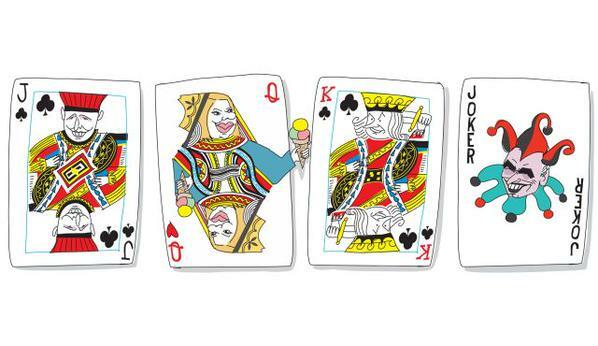 When most of the major players refuse to raise issues, what else could be expected? 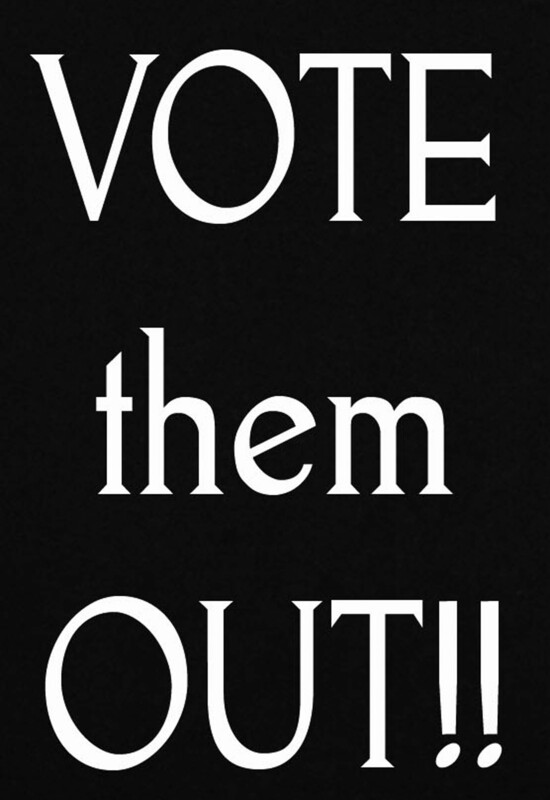 As things stand now, the only losers in the upcoming election will be the electorate themselves. 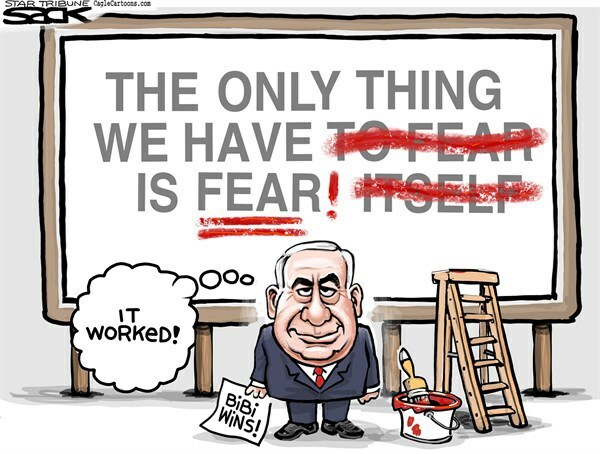 ‘Nothing is guaranteed because there is a huge, worldwide effort to topple the Likud government,’ says prime minister. Despite denials that his speech to Congress was a bid to boost his party in national elections in Israel, Benjamin Netanyahu’s party released a campaign ad showing him being applauded by congressmen. 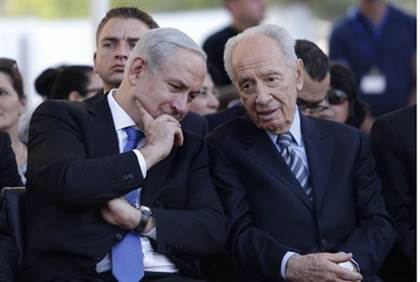 The 80-second ad released Thursday comes as polls show Israeli Prime Minister Benjamin Netanyahu and his Likud Party trailing the opposition Zionist Union by between three and five seats in Israel’s Knesset following the elections. The ad shows Netanyahu speaking in the House Chamber and shows at least one of his standing ovations from members of the U.S. House of Representatives and U.S. Senate. It juxtaposes scenes of Netanyahu speaking to Knesset, panning the empty seats of his opposition, to scenes of what appear to be a full House chamber and wild applause. 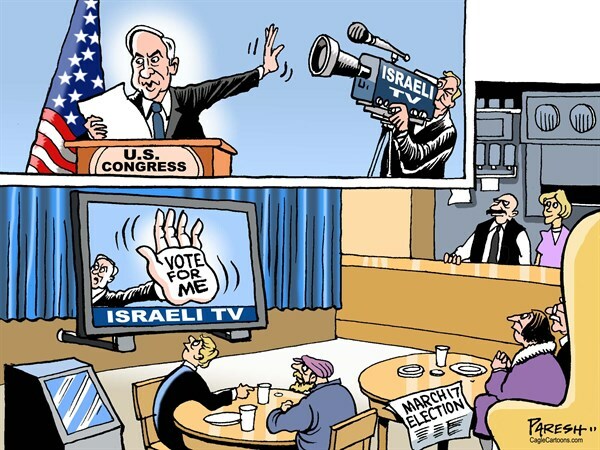 At least 60 congressmen boycotted the speech, citing, among other reasons, its taking place March 3, exactly two weeks before the Israeli elections. 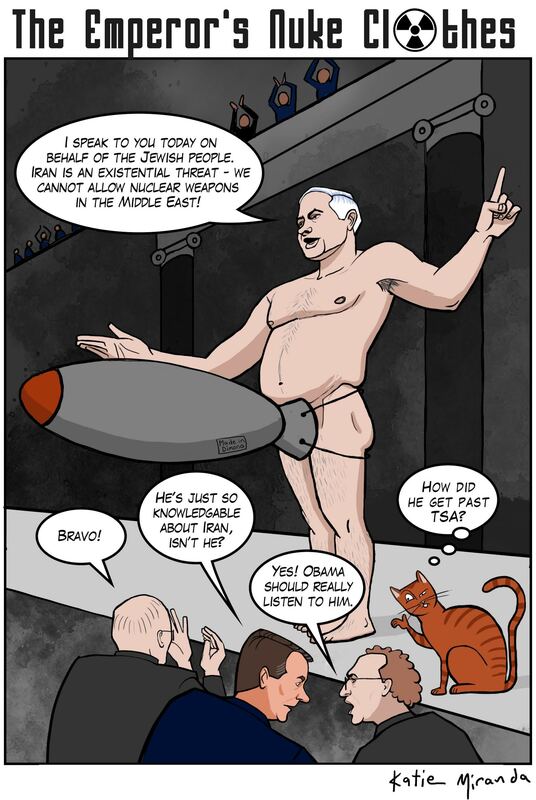 Netanyahu and his defenders said the preeminent reason for the speech was the urgency opposing Iran nuclear talks backed by President Barack Obama. The deadline for an outline of an agreement in the talks is March 24. 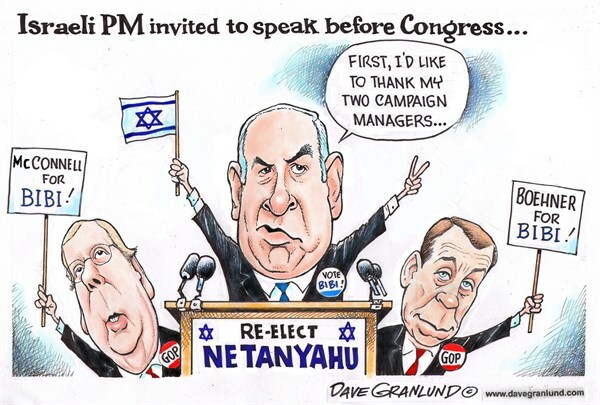 Netanyahu spoke at the invitation of the House Speaker John Boehner (R-Ohio), who in a breach of protocol did not consult the White House, congressional Democrats or the American Israel Public Affairs Committee. No Obama administration officials attended the speech, and Vice President Joe Biden, who conventionally co-chairs such events with the House speaker, was out of the country. Obama declined to meet with Netanyahu while he was in Washington, also citing the proximity of Israel’s national elections. After the incident, the party posted an image on their Facebook of Zoabi wiping herself from the liqud thrown at her, with the text “We kept our promise. We wiped her smile away”. 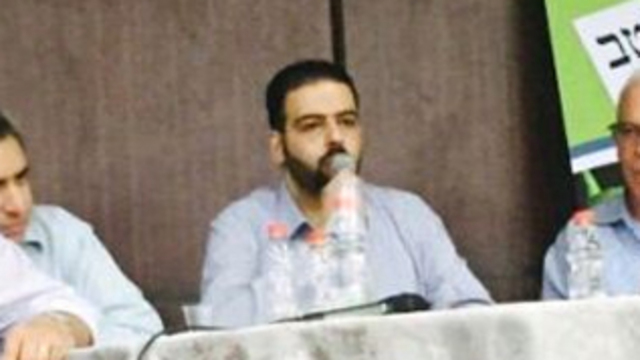 “The current election campaign continues the wave of racism, exclusion, and violence that characterized the latest government’s tenure,” said Aiman Uda, chairman of the United Arab List. 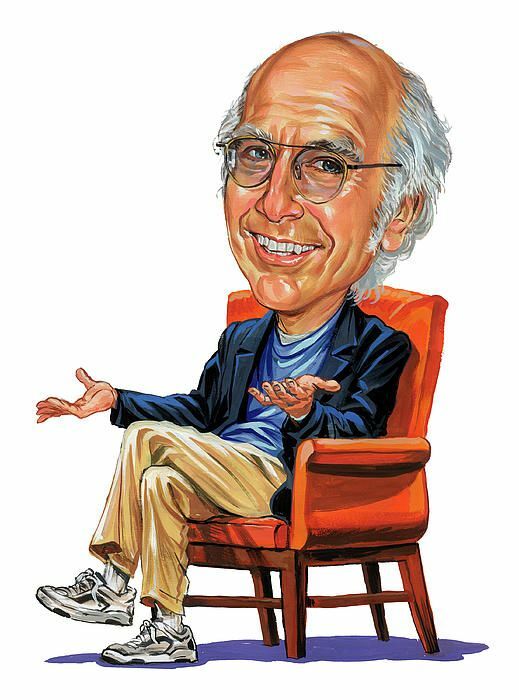 “It’s sad to see that even in academic institutions, it is no longer possible to have an open dialogue and present an array of opinions. 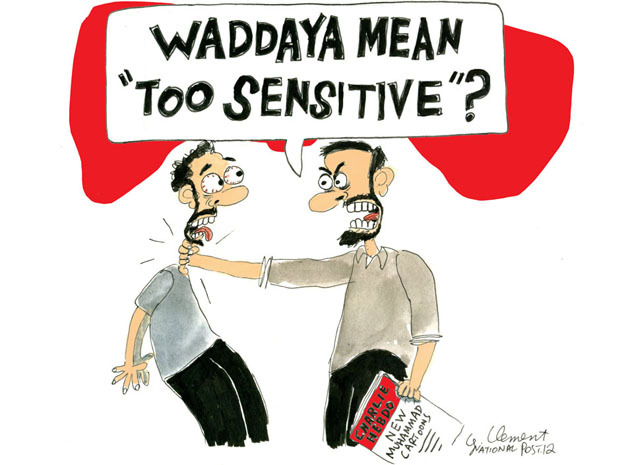 This is not the first time an Arab lawmaker has been attacked: In 2012, a young girl spat at MK Ahmad Tibi (United Arab List-Ta’al) was following a political debate at Bar-Ilan University. The incident also took place at an event involving the far right party – then called Otzma LeYisrael (Strength to Israel). “Majadele will learn not to insult women. He hurt the honor of the Knesset and of this place,” Michaeli said afterwards. She was later sanctioned for he actions by the Knesset and was also removed from the party’s ticket during the following election. The joint list’s platform — which was distributed at the Nazareth event — contains eight points. Foremost is a resolution to the Israeli-Palestinian conflict based on the two states, with East Jerusalem as a Palestinian capital and a “just solution” to the Palestinian refugee issue based on the right of return as enshrined by the United Nations. The platform calls for the dismantling of all West Bank settlements and the “racist separation wall.” “I think this is the one thing we didn’t have to argue about,” said Touma-Suleiman. All Together Now: Members of the Knesset from Israeli Arab parties gather to announce a unified joint list in Israel’s national election. 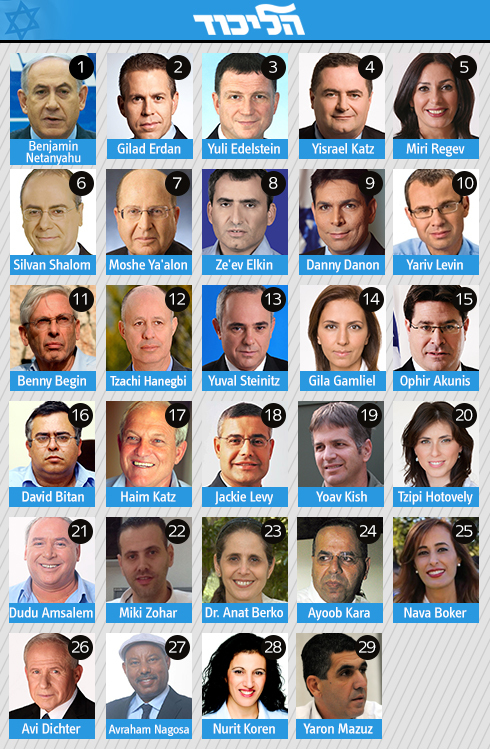 Can Israel’s New Arab List Make History? NAZARETH, ISRAEL — At 6 p.m. on a Saturday in mid February — while Jewish Israel was just powering back on after the Sabbath — about 2,000 Arab Israelis gathered in a ballroom in Nazareth’s industrial zone. The occasion was the campaign kickoff of a unified bloc of Arab political factions running together on one list for the first time in history, ahead of the Israeli election. Men in keffiyehs and suits, women and young families streamed into the room as reporters set up tripods near the stage. A group of college-age students wearing red shirts in support of Hadash, the joint Jewish-Arab communist party, stood in the back of the ballroom. Soon, the Knesset’s Arab luminaries, including Haneen Zoabi and Ahmad Tibi, took their seats at the front of the room. Dov Khenin, a Jewish parliamentarian in Hadash, sat at the end of the row. Later in the evening, the Beatles’ “Imagine” would play on the loudspeaker ahead of his Hebrew-language speech. 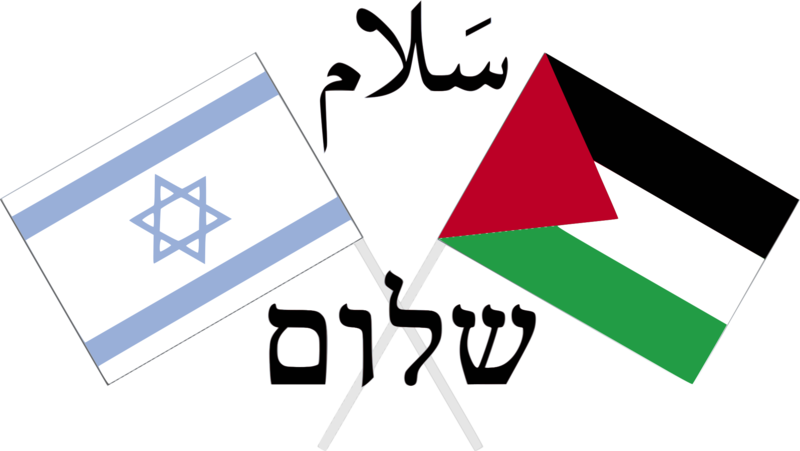 The joint list represents four different Arab parties inside Israel: Hadash, the Jewish-Arab communist party; Ra’am, an Islamist group whose base is in southern Israel; and Ta’al and Balad, two nationalist groups. 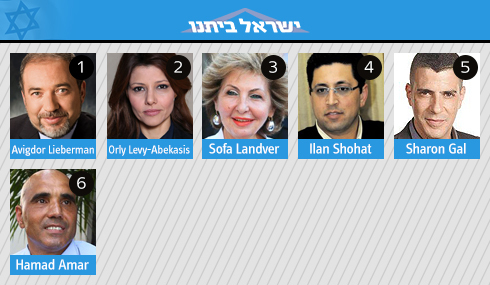 All four parties are currently represented in the Knesset: Hadash has four seats; Balad and Ra’am both have three. Ta’al’s only lawmaker is Tibi. 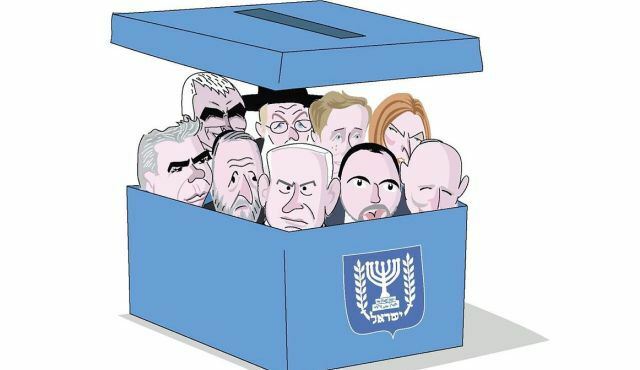 The impetus behind their unification, announced in January, was a new law engineered by Foreign Minister Avigdor Lieberman to raise the threshold for entering the Knesset from 2% to 3.25% of votes cast. That’s the equivalent of four seats, which would disqualify small parties. “Even a right-wing government has to understand that this is a new game now,” said Touma-Suleiman. Though the candidates have been united historically on most issues regarding Israel’s Arab minority, the joint effort bridged ideological fault lines, particularly on women’s rights. In the past, Balad — currently represented by Zoabi, an outspoken feminist — partnered with Hadash to increase Christian and Muslim women’s access to civil courts, a move opposed in the Knesset by Ra’am, the Islamic party, according to Jafar Farah, the director of Mossawa, an advocacy group for Arab Israelis. More recently, Khenin caused a small political quake among the list when he said he supported the sale of French magazine Charlie Hebdo in Israel and was criticized by Arab Israelis who were insulted by the publication’s depiction of the Prophet Muhammad. 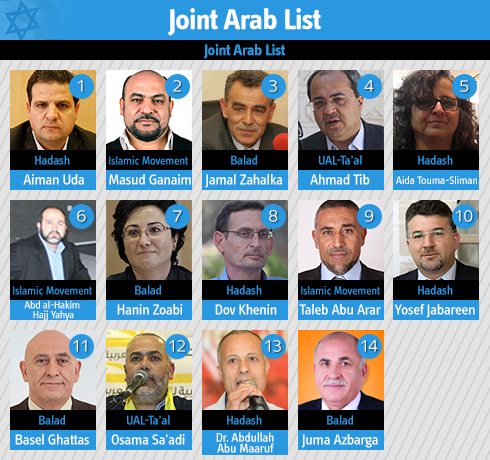 The list has the possibility not only to change Arab representation in the Knesset, but to fundamentally remake grassroots Arab politics inside of Israel for the first time in four decades. In 1976 — 10 years after Israel ended its military rule of Arabs inside the state — Israel announced that it would confiscate thousands of dunums of land in the Galilee for settlement and security reasons, sparking a series of Arab strikes and protests. In the ensuing clashes with the Israeli army and police, six Arabs were killed and hundreds arrested. 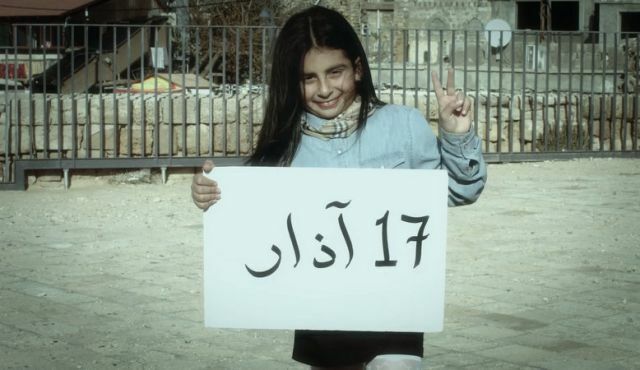 Land Day, as the event is remembered by Palestinians all over the world, was a turning point in Arab citizens’ relationship to the state, marking the end of Arabs voting for the Labor Party and the rise of Hadash. Since then, several other Arab political parties have made it to the Knesset, but their influence within the Israeli government has been limited. Though Arabs make up 20% of the Israeli public, no Arab party has ever been part of a governing coalition, nor has an Arab politician ever held a ministry portfolio. Arab voting in Israel has been on a downward decline over the past few decades: In the 2013 election, about 57% of Arabs voted, compared with the overall voting rate of 67%. Analysts estimate that 10% to 15% of the Arab public boycotts the Knesset elections as an ideological rejection of Israeli rule in historic Palestine. The Northern Islamic movement, a faction in Arab politics in favor of an Islamic state in Israel, opted not to be included in the joint list for this reason. Roughly 2,000 Arab Israelis gather in a ballroom in Nazareth’s industrial zone to celebrate the Arab List’s campaign kickoff. 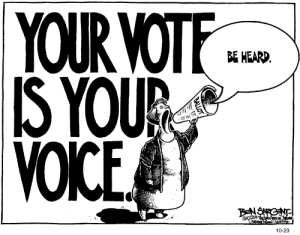 But many other Arabs simply don’t see the point in voting, particularly given Israel’s rightward shift in recent years, which has brought a host of proposals aimed against them, such as Jewish Nation State Bill, an effort to cement Israel’s status as a Jewish state. Arabs also point to the Central Election Committee’s disqualification of Zoabi — later overruled by the Israeli High Court — as further evidence of how Arab Knesset members are marginalized in the Israeli government. Over the summer, several Arab Knesset members were roughed up by the Israeli police in protests against the Gaza war. The unification of the Arab parties into a single Knesset list could begin to reverse the trend of low voter turnout among Arabs in Israel. According to a study published by the Abraham Fund, a not-for-profit focused on Jewish-Arab coexistence, voter turnout could rise by around 10%, up to almost 67% of voters. Some observers say the election could bring about a new political reality among Arab Israelis, not only in the Knesset, but also on the ground, by strengthening the democratic process inside Arab communities. 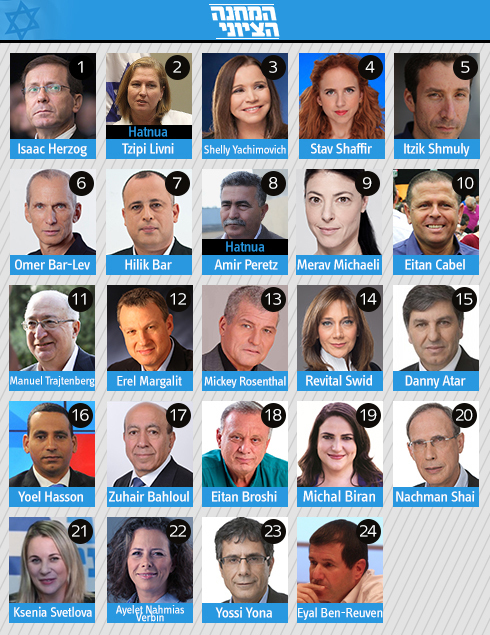 Arab-Israelis could, among other things, elect representatives for an Arab national body, which would no doubt influence the makeup of a future Knesset list. 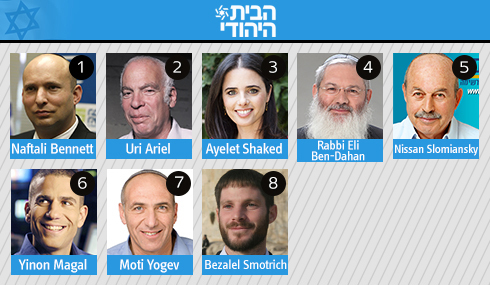 The center-left Zionist Camp also distanced itself from the list when it voted to disqualify Zoabi from the Knesset. There has been much talk in Israel since THIS was posted two days ago … adding to the non issues of the present election campaign. Video can be seen again towards the bottom of THIS report after it was removed from YouTube yesterday. So think about it. It’s not the house, it’s the landlords. Even those who were fooled by the misrepresentation of the poor condition of the prime minister’s residence cannot ignore Sara and Benjamin Netanyahu’s sickening behavior, as revealed in the state comptroller’s report. 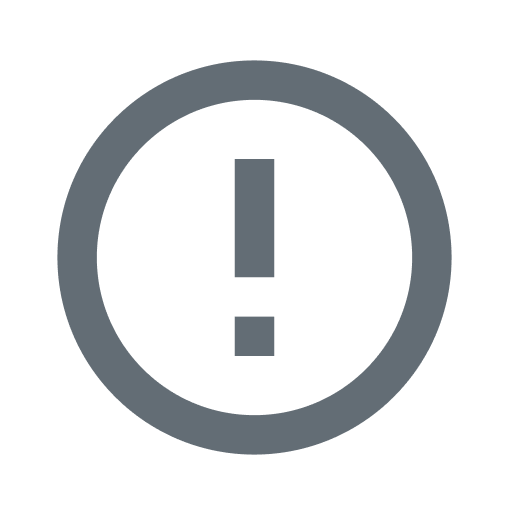 The really sickening thing about the state comptroller’s report is not the criminal issue. As always, it’s the small things, which teach us more than anything about Sara and Benjamin Netanyahu’s character. For example, the claim that employees from the Prime Minister’s Office were sent on all kinds of errands by Netanyahu and were forced to pay from their own pockets for his private purchases, and did not receive a refund for these expenses. Think for a minute about such an employee, who earns a few thousand shekels a month, and who is sent by the prime minister, who is worth tens of millions of shekels according to Forbes Magazine, to buy him eye drops, or newspapers, or a cup of coffee and a pastry. That worker, who can barely provide for his family, is already familiar with this ritual. He knows that he will never see the money again, but he can’t refuse the errand. Imagine him on his way to the local drugstore, as he calculates the money he is about to spend. And no, we don’t expect the prime minister to stand in line at the drugstore, as some of Netanyahu’s poodles who were sent to defend him claimed on Tuesday. Like Deputy Minister Tzipi Hotovely, who wasn’t ashamed to mock the criticism – because what is 42 shekels for a cold medication when it’s the prime minister we’re talking about? Well Hotovely, a few dozen shekels can mean a lot for some people, and there is no reason in the world why they should finance the prime minister’s private needs. We would expect the prime minister would make a gesture he is probably unfamiliar with and has never done in his life – put his hand in his pocket and pay his employee back for the expense. He should be the one settling the account with whoever he has to, not the employee. And it was so disgusting listening to Minister Gilad Erdan, an intelligent and eloquent guy, quoting the messages Mrs. Netanyahu had dictated to him several hours earlier, and willing to serve as the family’s rag and clean up all the dirt after them. And this is the man who wants to be responsible of the public coffers in the next term. How can a person who aspires to reach the highest positions defend Netanyahu’s attempt to avoid paying drought tax, a tax that he himself imposed and which all the citizens of the State of Israel are required to pay, except for the prime minister – for the water in his private swimming pool. So there’s no need to ask whether it’s criminal or not. There are those who believe that the report includes criminal aspects which the attorney general should look into. How long do you think it will take the attorney general to come back with answers? So let go of the criminal aspects. Each person should ask himself whether the things he was exposed to this week meet his standards. Because even those who were fooled by the misrepresentation of the poor condition of the prime minister’s residence, as it was reflected in the video produced by celebrity designer Moshik Galamin, could have been convinced on Tuesday that it’s not the house, it’s the landlords. Because there isn’t a reasonable person who would fall for the claim that with an expense budget of NIS 3.144 million (about $810,000) in 2011, they couldn’t have changed the curtain, fixed the doors, painted the walls and made sure that the shaky chairs the prime minister sits on when he goes down to the first-floor kitchen won’t creak. 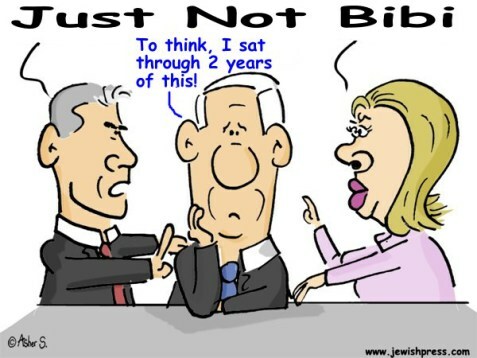 Or that with a cleaning budget which reached NIS 1.230 million that year, Mrs. Netanyahu should find dust on the lamp. More than NIS 75,000 a month for cleaning both houses – the Jerusalem residence and the private home in Caesarea – while they hardly even live in one of these houses. Yaakov Borovsky, a former major-general in the Israel Police, who is singlehandedly staining his magnificent career, was sent by the family on Tuesday to provide explanations and wasn’t ashamed to say that the house in Caesarea isn’t empty. Why there are security guards there all week long, and someone has to clean after them. I believe that even Sara Netanyahu’s heart missed a beat upon hearing that. security guards inside the Caesarea home? Heaven forbid. Why even the prime minister’s guests have no access to the house. And if we thought that the inflated budget for the candles consumed by the Netanyahu family would reduce the electricity bill, it turns out that the family consumes a private electrician. And not just an electrician, but one who arrives at the Caesarea home every week, including on Yom Kippur, and earned more than NIS 10,000 in three months. That electrician also happens to be a friend of the Netanyahu family, and he was employed against the recommendation of a special committee. And we have yet to talk about the clothing, makeup and hair design expenses, which reached NIS 144,000 during one of the examined years. And the money spent on meals ordered for the family members from gourmet restaurants. I wonder how many tons of schnitzel and mashed potatoes one can buy for more than NIS 70,000. So no, it’s not the house, it’s the landlords. And even if it’s not criminal, it’s sickening. In Galamin’s video, Sara Netanyahu tried to refute the rumors about hedonism, squandering, even about her obsession with order and cleanliness. She was willing to opened up a messy cupboard in front of the camera and present a finger covered with dust in order to prove that she is not what people think. Many were not fooled by this performance. Netanyahu’s supporters stood behind him as always. But what about the hundreds of thousands of undecided voters? What are they thinking now, the day after the report that proves it’s all true: The hedonism, the squandering. The disgusting stinginess. The prime minister’s unstoppable engagement in marginal issues. The fact that the Netanyahu family discounts people. That they treat their employees like subjects. That the emperor and empress think they are entitled to everything, that they won’t even take a penny out of their own pocket, even if it’s at the expense of hardworking employees. So does it really matter if it’s criminal or not, with this person as our leader? And what has he done in the past six years which justifies turning a blind eye, ignoring the corruption, the pretentiousness, the rule of a couple who thinks it deserves everything. An issue finally emerges in Israel’s ‘non-issue’ election campaign … one that both the ‘Left’ and the Right agree on … RACISM. The party that some hoped would defend Israeli democracy from attacks by the right wing has now joined the assault. Shimon Peres is back, his name is Isaac Herzog. 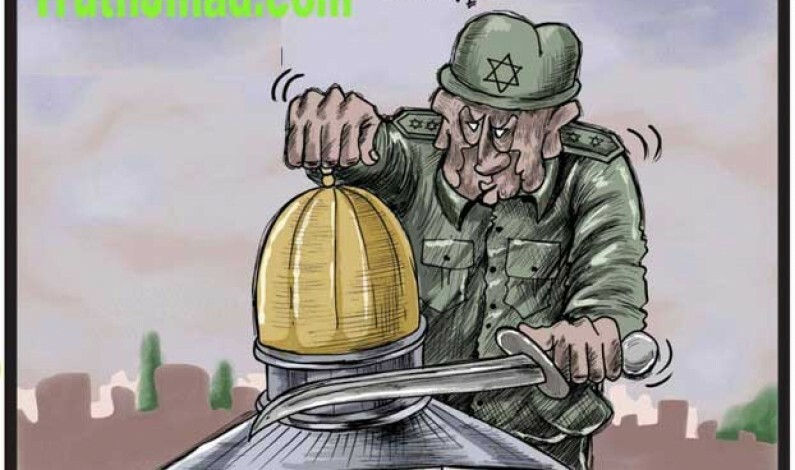 The evil wind of Mapai is also back, it’s called Zionist Camp. Appease, appease, appease everyone; set your sights on the right, only on the right, emulate it, stay away from any courageous step. Sometimes one unfortunate decision is enough to learn how the whole thing works. In the case of Zionist Camp it’s the decision to support the disqualification of MK Haneen Zoabi (Joint List) from running for the Knesset. With a left like this, we don’t need Yisrael Beiteinu chairman Avigdor Lieberman anymore; Likud’s Yariv Levin will do just fine. The only hope that Zionist Camp had managed to create was that at least it would stop the crushing of democracy by the right wing. 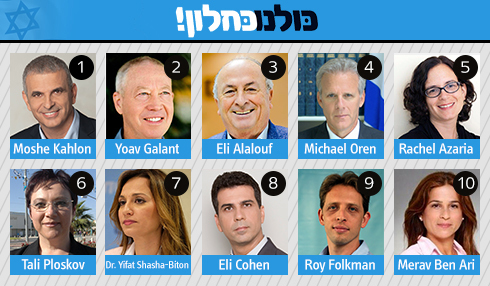 People like Herzog, MKs Tzipi Livni, Shelly Yacimovich, Merav Michaeli and Stav Shaffir know a thing or two about the dangers to democracy that lurk here. They also know that democracy’s real test is in its attitude to the Arabs and the radical left. Now this last hope has been dashed. If Zionist Camp disqualifies Zoabi, a brave, authentic and legitimate candidate who hasn’t hurt a fly and who reflects the views of her voters, the Arabs of Israel and lovers of democracy will know: On this issue too, there is no difference between the right wing and this left wing. After Herzog announced that “in the war on terror there is no difference,” now there’s no difference in the war on “Zoabis.” So what do we have this whole camp for? For Manuel Trajtenberg [the economist identified with the 2011 social protests, now on the Zionist Camp ticket]? The first thing the Arabs of Israel and their representatives in the Knesset must conclude is: No cooperation with Zionist Camp, not during the election and not after it. No voting for it and no recommending to the president that Herzog form the next government. Herzog signed the divorce decree himself, having already announced the exclusion of Joint List from his government. He has to pay the price. From that point of view, Zionist Camp has made a great contribution to the truth: There is no such thing as “Jewish” and “democratic.” In its decision, Zionist Camp has chosen “Jewish” at the expense of “democratic”: Zionist Camp knows that behind the decision to disqualify Zoabi is the transparent desire to remove all the “Zoabis” from the Knesset. There is no such thing as a democracy, where elected officials are prohibited from criticizing, as Zoabi is accused of doing, a member of their own people for serving in a police force that kills other members of their people. 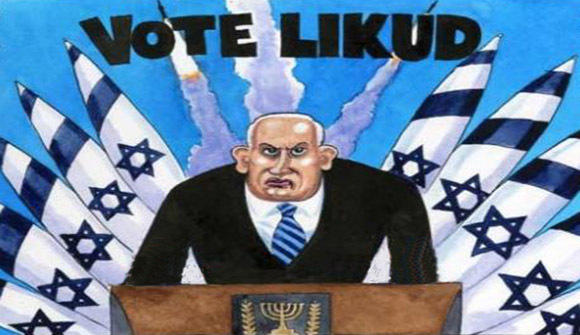 But a party that has chosen to call itself “Zionist Camp,” spitting in the face of the Arabs, some of whom supported it in the past, cannot but back the disqualification of an individual who threatens the Zionist order and challenges Jewish privileges in a distorted democracy. Zoabi should be disqualified, according to Herzog-Livni, because she endangers the tottering ideological structure on which their camp relies, which offers no solution to the Palestinian problem nor an answer for the Arabs of Israel. This camp knows only how to trick and mislead, in the best of its tradition. Livni wants to reach a settlement, but only to realize her dream of a Jewish state, a nationalist dream in every sense of the word. And Herzog only wants more negotiations, so there will be peace and quiet. 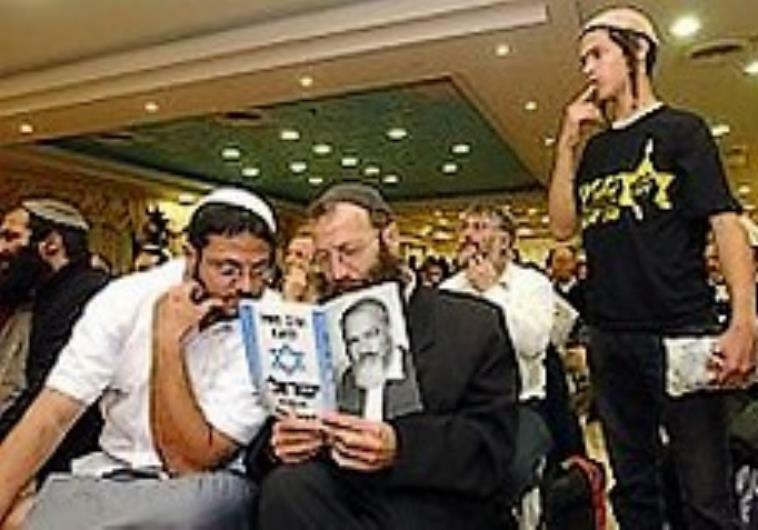 Aware of the slight damage the Zionist Camp could incur, it hastened to “balance” its decision: It will also support disqualification of ultra-right-winger Baruch Marzel. This preposterous balance, so typical, is even worse in its hypocrisy. The serial criminal, the violent, convicted thug is to the Zionist Camp comparable to Zoabi, who has never been convicted of anything. But trust Zionist Camp and the Arab sycophants. Soon enough we’ll certainly see Herzog and Livni touring the Arab communities, eatingknafeh, having photo ops with kafiyyeh-wearers and uttering pithy slogans about democracy, peace and equality. 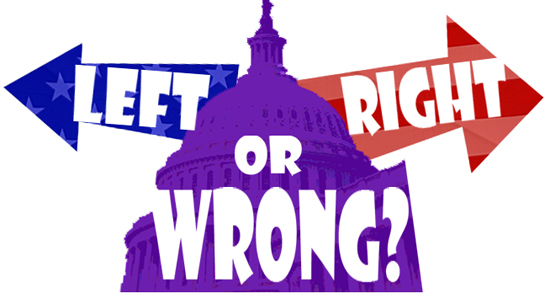 Both the left and the right are correct in what they say about each other; but both sides are also mistaken and misleading. 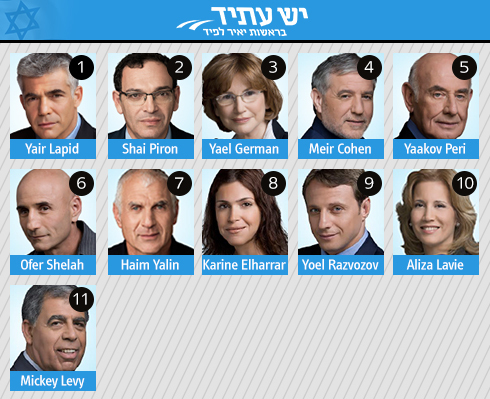 I really envy those who already know who they will vote for in the Knesset elections in about a month and a half. Electing a government is not just about electing a prime minister and his ministers. From many aspects, it’s almost a matter of life and death. Both sides, the left and the right, are correct in what they say about each other. But both are also mistaken and lost and misleading. People often quote Israel’s late President Chaim Herzog, who apparently said once that “the trouble in our country is that the left has no heart and the right has no brains.” Is that so? Here’s an interim summary. The lost ones in the right: They are hanging on to something which is out of this world. God. Faith, a promise that has come down from Heaven. We are the chosen people. The Land of Israel was promised to us in the Book of Books and in its statements. How many times does the word “Jerusalem” appear in the Koran? And in the Bible? We wandered in the Diaspora for 2,000 years and we always dreamed and prayed for Zion. The right also bases its explanations on facts from the ground: The Arabs have at least 22 countries. 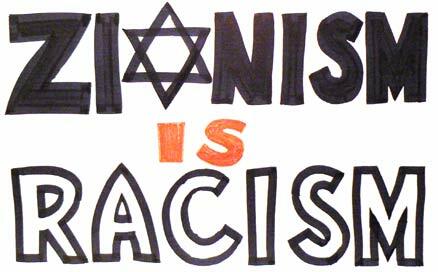 The Zionist Movement is the physical embodiment of the Return of Zion. As Jews, we have no other land to safely lay our head on to establish Jewish life. There is no room for two people on the same piece of land. It’s either us or them. The Arabs have lost the wars and the losing side must pay. All the Arabs want and will always want to destroy us. Arab terror will never stop. They are brutal. They will never forgive us. Arabs cannot be trusted. A good Arab is a dead Arab. The IDF will always win and is the best army in the world. The world never loved Jews. We have always done things our way and the world has come to terms with our moves. The world was anyway always against us. Faith is the most important thing. We are right. And the left? It’s destroying the state. A fifth column. It’s willing to give the Arabs everything. The Arabs will never accept peace. Death to the Arabs and, at the same occasion, to the leftists too. And so on and so forth. The mistaken ones in the left: We won’t be able to live on this piece of land without peace. Shall the sword devour forever? There are 1.5 billion Muslims in the world who will defeat us by the power of their number alone. The world’s countries only have interests, and the Israeli interest is not their main concern. We cannot and are not entitled to control 3.2 million Palestinians who don’t want our rule and are seeking freedom and liberty and the right of self-determination. The occupation is corrupting us. the Arabs want peace. It’s a fact that our peace with Egypt has lasted for more than 35 years. Our peace with Jordan is 20 years old. Even if some of the Arabs want to destroy us, the majority of Arabs recognize our military power and are deterred by it. The Arabs dream of peace and fight for peace. Only few engage in Arab terror. 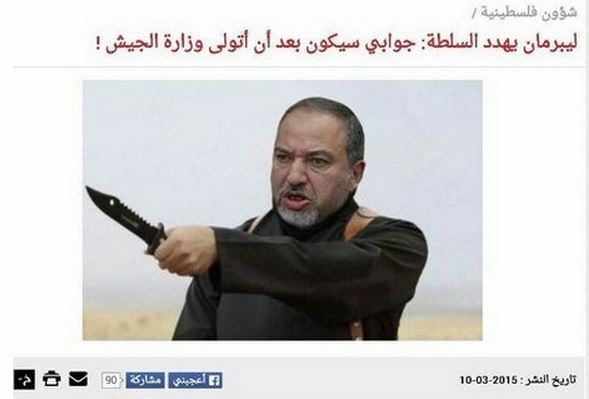 After we return the territories as part of a peace agreement, Arab terror will die out. The Arabs also want to rest and want peace and tranquility for their children. The Israelis stole their lands in the War of Independence and the following years, and built dozens of settlements on lands which belonged to the Arabs. They should be returned. The world’s nations does not approve of an Israeli government in the territories. We are losing whatever legitimacy we have left in the world. 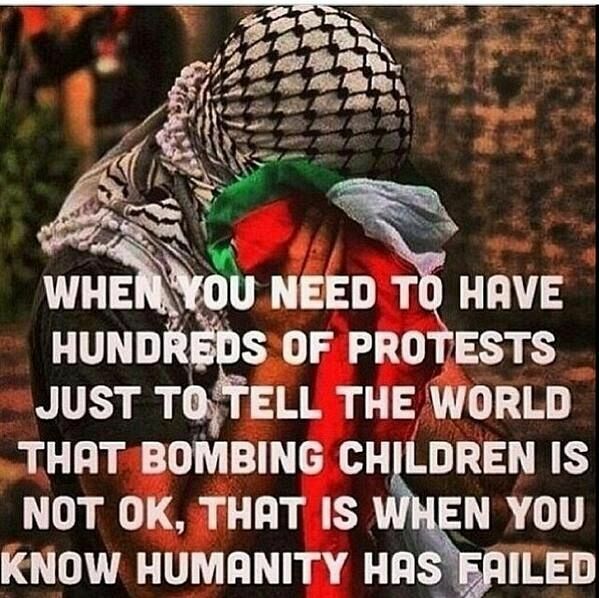 The world is no longer doing us a favor following the Holocaust, and sees the Palestinians as its subsequent victims. That’s enough. It reminds me of the joke about the husband and his wife who got into a fight and went to see the town’s rabbi, who ruled that the husband was right and that the wife was also right. And when the caretaker asked how it was possible that they were both right, the rabbi said: You’re also right. This shabby and worn-out joke would make us laugh if it weren’t on us. 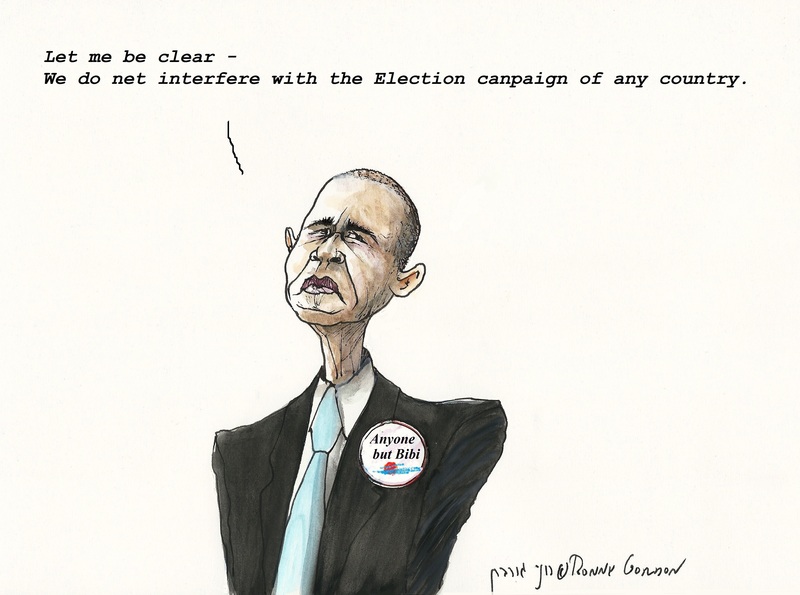 Jewish Israelis living in perpetual denial should take note when they head to their polling booths this March, for their sake if not for ours. The looming fork in the road for us is signposted “Palestinian Statehood” or “Civil Rights for All.” While the idea of the former is dispensable, the coming of the latter is inevitable. Israel pretends its society is a normal, US-style melting pot, but there are only two problems – there is nothing remotely “normal” about Israeli’s societal composition and, furthermore, the pot’s ingredients, by policy design, have yet to melt. The destructive societal divisions amongst Israel’s population shines through during every election; this time around is no different. While Israel’s nearly five-decade military occupation of Palestinians is slowly, but surely, ripping Israel out of its global comfort zone, not one electoral contender has peeped a word about how the occupation will come to an end. 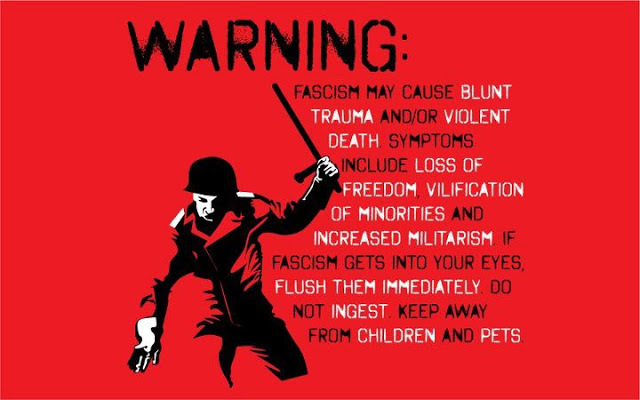 Likewise, while racism inside Israel against Christian and Muslim Palestinians—full Israeli citizens—has reached levels provoking even some Jewish Israelis to call it fascism, Israel’s political parties are acting as if it’s business-as-usual. The only bold and somewhat refreshing electoral move, thus far, is Avraham Burg’s joining of the Hadash Political Party, and even there the debate immediately focused around Palestinian political parties running in a single slate, or not, instead of the seismic shift that Burg’s move represents amongst Israel’s Zionist personalities. Bottom line for us Palestinians ‘living’ under Israel’s boot of occupation: Historically, in the USA and many other places, when a population is long disenfranchised, unrest ensues, forcing greater equality. 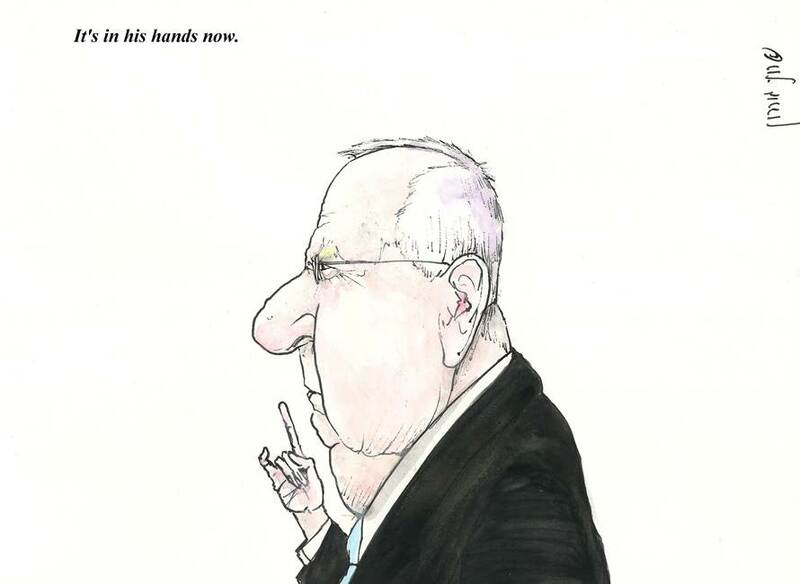 Another non issue circulating in the Israeli election arena …. The only issue being why a candidate belonging to an outlawed terrorist organisation is even allowed to run for the Knesset in the first place. 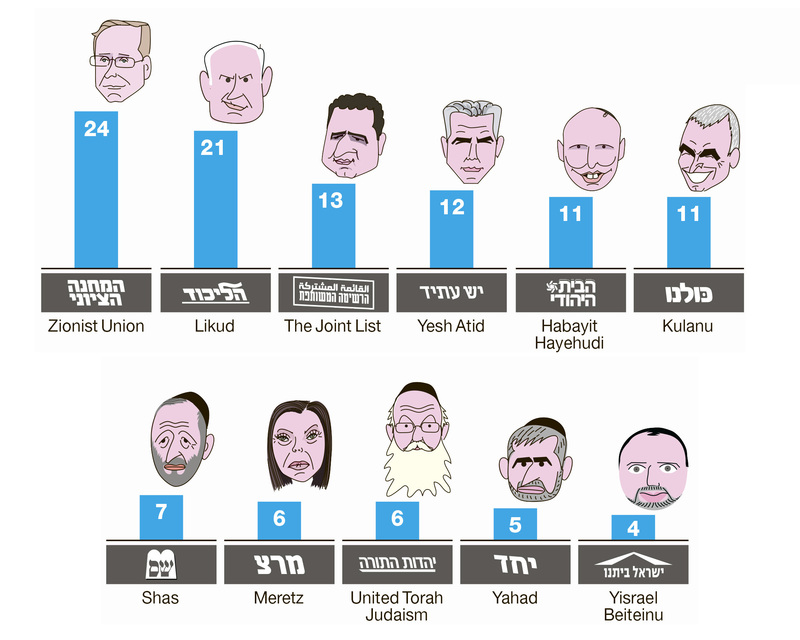 Most surveys show that Yishai’s party will earn enough votes, with the help of Marzel’s die-hard supporters, for Marzel to enter the Knesset. Needless to say, MOST of the Israeli electorate did not participate in any of those imaginary surveys. 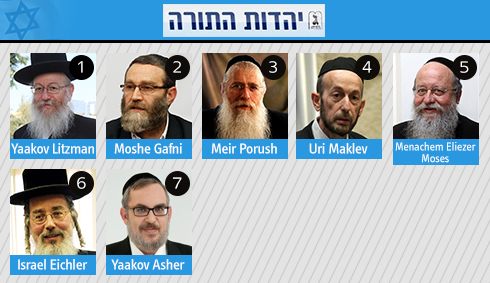 Baruch Marzel of Hevron is number 4 on Ha’am Itanu’s list, and one story going around explains how he’s viewed in his hometown. 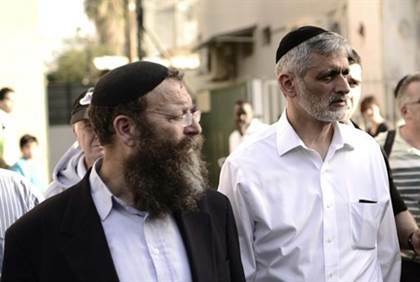 With the entry of Hevron loyalist and activist Baruch Marzel into the Knesset election race, a story of his “correct” relations with his Arab neighbors in Hevron has been making the rounds. Marzel’s daughter Racheli, 16 years old at the time of the story, had lost her cell phone. As is customary, she dialed the number to see if it would be answered, and possibly the phone could be recovered. 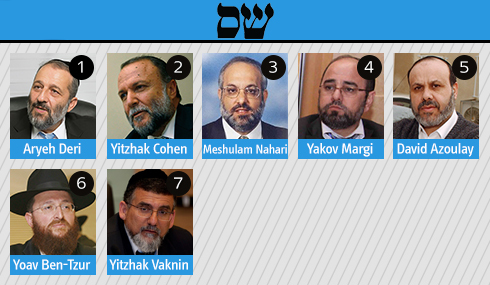 Baruch Marzel is number four on the party list of Eli Yishai (Yachad – Ha’am Itanu). He has run for Knesset in the past, but did not succeed. He gave up a fair chance for a seat two elections ago when he allowed Dr. Michael Ben-Ari – considered by some as less “extreme” – to take his place on the National Union party list. Ben-Ari returned the favor just last week when, apparently considered too “extreme” by Eli Yishai, he agreed to have Marzel run instead of him.